This was to be expected. Not only is Davis a true superstar, the kind of player you can build a championship team around, but he’s also represented by Rich Paul, LeBron James’s agent and one of the most powerful backroom masterminds in the league. New Orleans expected this. Maybe not in late January, less than two weeks before the Feb. 7 trade deadline, but the Pelicans expected it. When Davis linked up with Paul—the agent for LeBron James, who has specialized in recent years at steering his other clients toward teams LeBron plays on—they knew Davis’s days there were numbered. It’s why last summer several people in the organization tried to steer Davis away from Paul, two sources close to the situation told The Crossover. Davis signed with Paul’s Klutch Sports Group last year, and though that’s not a definitive “I’m going to play with LeBron, deal with it” move, it’s as close as you can get in the modern NBA. When the Lakers failed to nab Kawhi Leonard or Paul George in the summer, the team’s focus shifted to the Large Unibrow. If Davis has made it known throughout the league that he will only sign a long-term deal with the Lakers, he now has to hope that he can win a game of chicken with the Pelicans. The whole point of getting that message around the league is to weaken the trade packages offered by teams who are suddenly concerned that they would only be paying for a one-year rental, and to convince the Pelicans that whatever they can get from the Lakers right now is the best they can do. But New Orleans has every reason to stand pat, at least until the Celtics come into play over the summer (Boston can’t trade for Davis now because both Davis and Kyrie Irving are “Rose Rule” players; they have to wait until July to make an offer). There’s little chance that New Orleans can find a better offer than the best hypothetical package that Boston can offer, and the Celtics are likely in the best position to convince Davis (perhaps by winning a title next season) that he should stay for the long haul. Would a supporting cast of Kyrie Irving (if he re-signs, which isn’t a certainty), Gordon Hayward’s slowly re-animating corpse, and whichever young players Boston is able to keep be enticing enough to get Davis to re-sign? Probably! That team wouldn’t just shoot up the Eastern Conference power rankings; it would likely become the first non-LeBron East threat to win a title since the 2010 Celtics. Also, by the time Davis’s current contract ends in the summer of 2020, LeBron will be his age-36 season; unless he truly is a cyborg that will play at GOAT level forever, he will likely be slowing down by then. Will that be enough to entice Davis to abandon Boston and its young core? 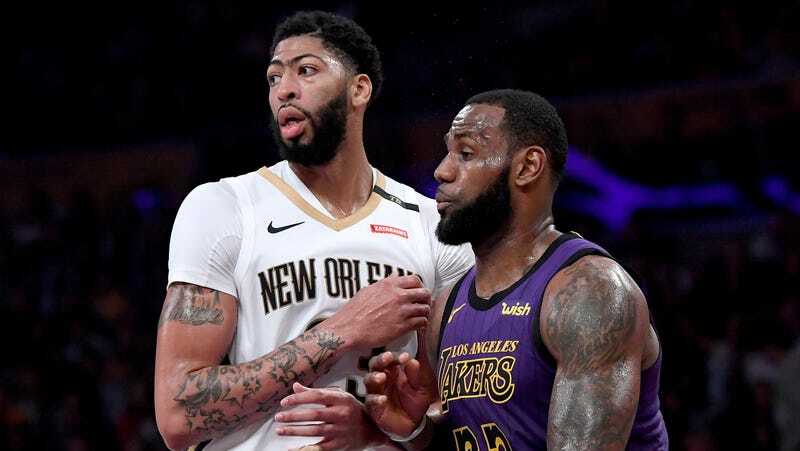 If Davis and Paul (and LeBron, let’s be real) get their way, though, New Orleans might get spooked enough by the potential of lowball rental offers this summer to get what they can out of the Lakers now. All there is to do now is wait and see who has more resolve.